Designed as the perfect match, this elegant bridal set is made to make your romantic journey unforgettable. Crafted in contemporary 9ct white gold, the wedding band is claw set with sparkling diamonds, complemented by an engagement ring featuring an illusion halo setting. Totalling 1/4cts. 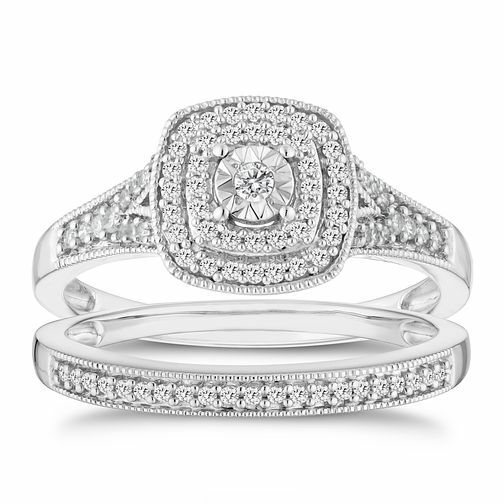 9ct White Gold 1/4ct Diamond Illusion Set Bridal Set is rated 5.0 out of 5 by 2. Rated 5 out of 5 by Anonymous from Quality!!! My fiancée to be picked this product a year before our engagement. She was still blown away with it when I popped the question. It looks a million dollars on her finger & a lot more than I paid for it.